LONDON (AP) – John Isner already had won the longest match in Wimbledon – and tennis – history. And now he’s lost the second-longest one ever played at the All England Club. So there’s not much better an authority to weigh in on whether it’s time for fifth-set tiebreakers at all Grand Slam tournaments. Actually, both Isner and Kevin Anderson, the man who won their Wimbledon semifinal 26-24 in the final set after more than 6 1/2 hours Friday, agree a switch is necessary. The 33-year-old American is best known, of course, for beating Nicolas Mahut 70-68 in the fifth set of an 11-hour, 5-minute match that was contested over three days in Wimbledon’s first round in 2010. This one seems rather tidy by comparison: Anderson won 7-6 (6), 6-7 (5), 6-7 (9), 6-4, 26-24. Still, Isner did jokingly ask chair umpire Marija Cicak at one point during the last set whether they could play a tiebreaker. That’s how the U.S. Open settles things at 6-all in the fifth set of a men’s singles match – or at 6-all in the third set for women – and has since 1970. But the other three Grand Slam tournaments all play on until one player wins by two games. He and Isner suggested one possible compromise: a tiebreaker at 12-all. “A sensible option,” Isner called it. 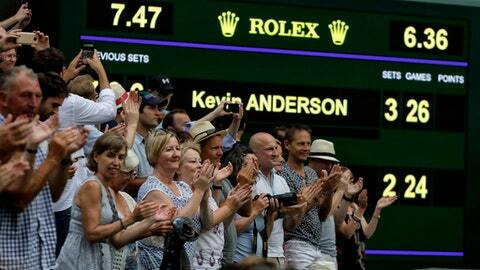 Anderson noted that some members of the Centre Court crowd were ready for his match to end, so that the day’s second semifinal, between Rafael Nadal and Novak Djokovic, could begin. Now he’s going to have to use Saturday to try to rest and recover so he can give it his best shot in Sunday’s final. Isner had nothing left to give after his 70-68 record-setter eight years ago, and lost his next match. Of course, Isner would love to have to deal with such problems now. He also would love it if this were never again an issue.